Figgy Duff had its origins since the first settlers came to Newfoundland & Labrador. 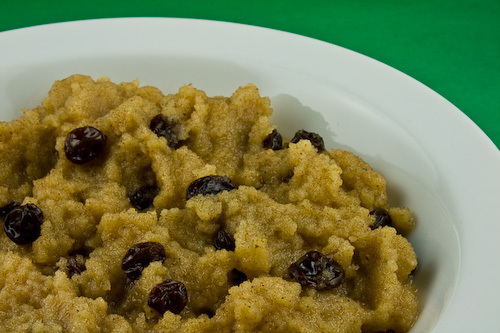 Simply put, figgy duff is a raisin pudding which is traditionally boiled in a cloth bag and served steaming hot. A “figgy” refers to the raisins in the mixture. The “duff” refers to the dough mixture Most families enjoy this special tasty treat on special days known as “duff days” in many parts of the island. I enjoy having a Sunday dinner, especially at grandma’s when she makes her own figgy duff. I’ve tasted none that can compare. Combine dry ingredients and add milk and egg. Place in cloth bag and broil for 1 hour in a pot of water. Ingredients can be steamed in a pudding mold. To make a plain duff, follow the same recipe but omit raisins. Posted on September 6, 2010, in Cuisine and tagged bake, Baking and Confections, Baking powder, Breads, cook, cooking, cuisine, duff, figgy, home, Newfoundland, Newfoundland and Labrador, pudding, raisin, recipe. Bookmark the permalink. 11 Comments. Just catching up on your latest posts. Very enjoyable reads and some very nice photos. Thanks. I enjoy it as well. Many thanks for this fantastic post, I am glad I discovered this website on google. blog and will come back someday. I want to encourage yourself to continue your great work, have a nice day! Thanks for the recipes Chris. Very glad you take the time to put them up here.